The No Walls Ministry does not believe you need to worship or share God’s love in a building, but choose to follow Christ’s example of sharing God’s principles where the people are. All money raised by the No Walls Ministry is to expand the concept of “no walls evangelizing” and our local charities. Currently we are an all volunteer organization and have no paid employees. We are encouraging our minister/members to forward photos and information about their personal ministries and the good they are doing in their communities. The No Walls Ministry has no affiliation with any associations as we choose to remain a totally independent Christian online ministry and a neighborhood/regional ministry. The No Walls Ministry mission is to serve God by serving others. The No Walls Ministry staff is keen on volunteering their time and energy in our daily lives and encourage our ordained ministers and wedding officiants to do what they can to make their neighborhoods a better place. We will soon be sharing stories and experiences of our member’s that have had profound effects on others through their ordained ministry functions. Please feel free to send us your stories and experiences to admin@nowallsministry.com so we can share them on this site in the near future. 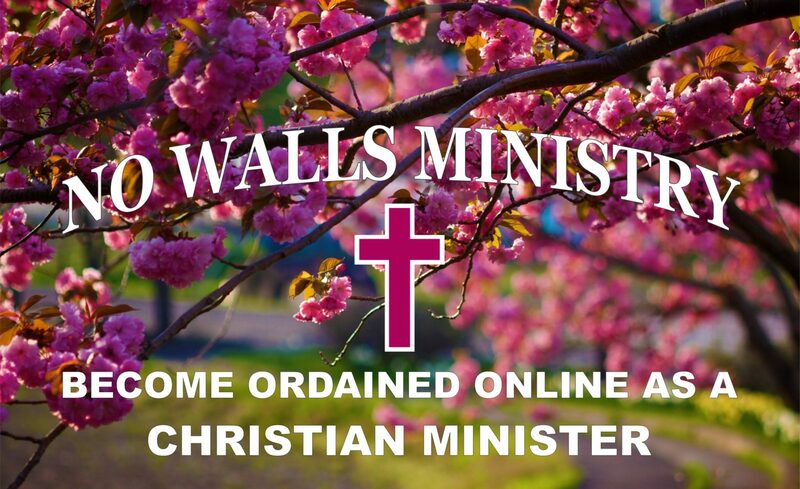 Continue to follow the No Walls Ministry as our site grows to assist you in becoming an ordained minister or wedding officiant.